You'll be £12.99 closer to your next £10.00 credit when you purchase With Hitler to the End. What's this? Heinz Linge worked with Adolf Hitler for a ten year period from 1935 until the Führer's death in the Berlin bunker in May 1945. He was one of the last to leave the bunker and was responsible for guarding the door while Hitler killed himself. During his years of service, Linge was responsible for all aspects of Hitler's household and was constantly by his side. He claims that only Eva Braun stood closer to Hitler over these years. Through a host of anecdotes and observations, Linge recounts the daily routine in Hitler's household; his eating habits, his foibles, his preferences, his sense of humour and his private life with Eva Braun. In fact, Linge believed Hitler's closest companion was his dog Blondi. After the war Linge said in an interview, 'it was easier for him to sign a death warrant for an officer on the front than to swallow bad news about the health of his dog'. Linge also charts the changes in Hitler's character during the period of his service, and the latter's fading health from around 1942. During his last days, Hitler's right eye began to hurt intensely and Linge was responsible for administering cocaine drops to kill the pain. In a number of instances – such as with the Stauffenberg bomb plot of July 1944 – Linge gives an excellent eyewitness account of events. He also gives thumbnail profiles of the prominent members of Hitler's 'court': Hess, Speer, Bormann and Ribbentrop amongst them. Though Linge held an SS rank, he claims not to have been a Nazi Party member. His profile of Hitler is not blindly uncritical, but it is nonetheless affectionate. The Hitler that emerges is a multifaceted individual: unpredictable and demanding, but not of an otherwise unpleasant nature. Throughout this somewhat quasi-autobiographical novel by Heinz Linge, the words of a man “duty-bound” to his boss pour out to paint one man’s picture of living and working alongside one of the most infamous characters to dawn the pages of history in the 20th century are poured out over 18 chapters. The introduction is eloquently written by Roger Moorehouse and the preface by Linge himself. There are 12 black and white photographs nestled within the midpoint on the book showing Linge alongside his “master”. The book in thought-provoking at best as Linge discusses the highest ranking members of the Nazi Party and how he sees them. He paints an alternative picture of the person we have all come to know as a madman, as being a more or an average person enjoying simple pleasures of life. This book is worth reading from a historical standpoint and does show us bit more of the behind the scenes portrayal of the man who brought Europe to the brink of total annihilation through “the man closest to him” in his own words. Some of the reading can seem a bit “he said, she said” in respects to Linge explaining his experiences and the actions and remembrances of his comrades in arms. Taking his overwhelming devotion to his country and to his proprietor contextually make an attempt at explaining his thoughts and actions throughout this practically unexplainable time in history. anyone trying to understand history’s most notorious figure. There is something creepy yet fascinating about this memoir by an individual who spent years working daily with Adolf Hitler . . . The scariest thing about [With Hitler to the End is its] showing that Hitler could be quite charming – a seemingly regular guy, or at least as regular as anyone who killed millions could ever be. Of interest to anyone seeking more insight into the everyday life of one of history's monsters. 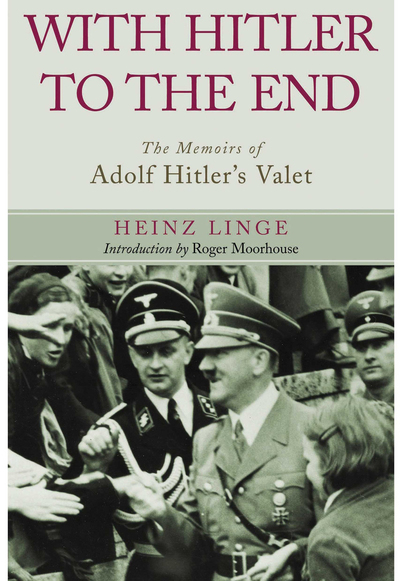 Hitler's personal valet Heinz Linge was never more than a click of the fingers away from his master and stood by him until the end in Berlin in 1945 . . . Now his incredible story has been translated into English for the first time and casts new light on what it was like to be constantly alongside the Nazi despot. 'With Hitler to the End' gives incredible insight for anyone wanting to understand the twentieth century's most pivotal character. to enter the war on Germany’s side. In the valley of the valets, overhearing often cedes very quickly to advising.